So you’re thinking about flipping a house? You like the idea of taking something old and making it new—and making some money too—and you’re ready to dive in. I know the feeling! I regularly work on investment property renovations. Sometimes for myself; sometimes for clients. I love the process of revitalizing a property and giving it a new life. It’s also very cool to see the finished product of all your hard work. While flipping houses, condos or apartments can be fun and rewarding, it’s also hard work. There’s a lot of risk involved. You’re investing a lot of money into a property with the idea that you’ll get it back… and then some. But, as anyone who’s ever watched shows like Flip or Flop knows, the unexpected often happens. You run into problems and costs you didn’t see coming. And, at the end of the day, you have to be able to sell or rent the property. Make no mistake about it, flipping a property isn’t easy. But there are things you can do to increase your chances of success. 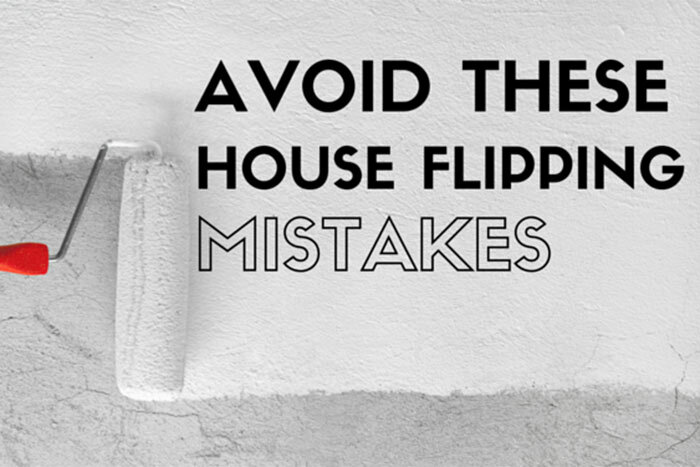 A good starting point is to know and avoid some of the common mistakes house flippers make. Here are the most common missteps people make when flipping a house. When you’re flipping a house, it’s easy to get hung up on the math. If you buy a property for x dollars, then sink x dollars into renovations, you can sell or rent the property for x dollars, and make x dollars profit. Who is going to want to live in this neighborhood? Who is going to be willing to pay the desired asking price? Who are you going to renovate this property to appeal to? The audience for your property should be the focus of the entire project. Is it a family? Millennials who want to live in a hip area? Wealthy professionals? You have to know who your buyer or renter is, and create a strategy for your renovation and pricing around them. At EZR, we’ve recently renovated a lot of rental properties geared toward Millennials. Knowing this is our audience enables us to invest in design features they find valuable, along with add-ons like washers and dryers that increase their appeal and value at the ideal price point. Many first-time flippers spend so much time finding the right house at the right price that they overlook the neighborhood. Don’t forget to consider the pros and cons of the area just like your future residents will. Is this a neighborhood on the upswing or downswing? Are a lot of people buying and selling in the area—and, if so, why? What demographic does this neighborhood appeal to (see above) and why? Flipping a property in an area that’s losing favor may look like a better return on paper than it actually is, especially since it could take longer to sell or rent. Conversely, flipping a house in an up-and-coming neighborhood can be a smart move because it will be easier to sell or rent. There’s a reason we renovate so many properties in Midtown Memphis. The area is experiencing a resurgence and the location is highly desirable to Millennials. And the properties in this area give us a great base to work with. When marketing the property, you also want to know the key selling points. Is the home within walking distance of some hip restaurants? What about close proximity to a park? What would the commute be like for a white collar worker? These things can make as much, if not more, difference than the upgrades you make. This is a biggie. Maybe even the most important tip on this list. A good contractor will make your renovation project a whole lot easier. A bad contractor can turn your project into a nightmare. Maybe you think you don’t need to worry about this because you’re going to do it all yourself? Unless you plan on holding onto the property for a year or more, or living in the home while you renovate, that’s a bad idea. There’s just too much work, time and stress involved with a property renovation to go it alone. At EZR, we work regularly with our trusted contractor HCCI Construction. I can honestly say they make every project we work on together better than it would be otherwise. Along with doing great work, they help us solve problems and make smart suggestions all the time. The work of a quality, experienced contractor will undoubtedly shine through in the finished product. So make sure you have a contractor. And make sure it’s a good one. In the long run, this will be one of the smartest investments you can make. Many house flippers are aggressive and optimistic in their planning. They plan for the best-case scenario and underestimate the time and costs involved. The problem is the best-case scenario is a rare occurrence. Sure, you should always aim to get things done as quickly, efficiently and effectively as possible. But as I mentioned earlier, the unexpected often rears its ugly head when it comes to renovations. That’s why the smarter thing to do when you’re putting your initial plan, timeline and budget together is to overestimate. By creating some space for the unexpected, you won’t be blindsided if/when it happens. And if you do manage to achieve your best-case scenario, the allotted time and money just goes back into your pocket. Many flippers think in basic renovation terms. Let’s open the space between the kitchen and living room. Let’s redo the bathroom. Let’s pull up the carpet and install hardwood floors. But there’s another important aspect: Design. The design elements you choose can have a huge impact on how your property shows and how much people are willing to pay for it. Details like bathroom tile, kitchen backsplash, and countertops make a big difference. These may seem like extras, but they often turn out to be the things people remember most about the properties. One final tip: Don’t design the place for you. That’s a mistake many house flippers make. They design from their own tastes instead of the target resident’s tastes. If possible, get a designer to help you make the best choices. When it comes to flipping properties, every hour and dollar you invest are valuable. Spend them wisely. Don’t fall into the traps above that have derailed so many house-flipping projects. Think ahead and put yourself in the very best position for success.